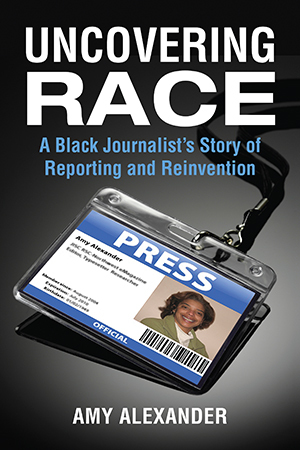 From an award-winning black journalist, a tough-minded look at the treatment of ethnic minorities both in newsrooms and in the reporting that comes out of them, within the changing media landscape. From the Rodney King riots to the racial inequities of the new digital media, Amy Alexander has chronicled the biggest race and class stories of the modern era in American journalism. Beginning in the bare-knuckled newsrooms of 1980s San Francisco, her career spans a period of industry-wide economic collapse and tremendous national demographic changes. Despite reporting in some of the country’s most diverse cities, including San Francisco, Boston, and Miami, Alexander consistently encountered a stubbornly white, male press corps and a surprising lack of news concerning the ethnic communities in these multicultural metropolises. Driven to shed light on the race and class struggles taking place in the United States, Alexander embarked on a rollercoaster career marked by cultural conflicts within newsrooms. Along the way, her identity as a black woman journalist changed dramatically, an evolution that coincided with sweeping changes in the media industry and the advent of the Internet. Armed with census data and news-industry demographic research, Alexander explains how the so-called New Media is reenacting Old Media’s biases. She argues that the idea of newsroom diversity-at best an afterthought in good economic times-has all but fallen off the table as the industry fights for its economic life, a dynamic that will ultimately speed the demise of venerable news outlets. Moreover, for the shrinking number of journalists of color who currently work at big news organizations, the lingering ethos of having to be “twice as good” as their white counterparts continues; it is a reality that threatens to stifle another generation of practitioners from “non-traditional” backgrounds. In this hard-hitting account, Alexander evaluates her own career in the context of the continually evolving story of America’s growing ethnic populations and the homogenous newsrooms producing our nation’s too often monochromatic coverage. This veteran journalist examines the major news stories that were entrenched in the great race debate of the past three decades, stories like those of Elian Gonzalez, Janet Cooke, Jayson Blair, Tavis Smiley, the tragedy of Hurricane Katrina, and the election of Barack Obama. Uncovering Race offers sharp analysis of how race, gender, and class come to bear on newsrooms, and takes aim at mainstream media’s failure to successfully cover a browner, younger nation-a failure that Alexander argues is speeding news organizations’ demise faster than the Internet. Six Minnesota: Is “Well-Meaning” Good Enough?